At this point I have painted two further monochrome layers in various shades of greys. I use a black which I mix myself because I find the pre-mixed ones to be too flat and dull. Each layer has to be allowed to dry before the next, so it does take patience! Looking great, Sandra! I love looking at processes. And I'm glad to read that you make your own blacks - me, too, for the same reason. They are so much more alive. I drink a toast with you, great work. Ahhh ! Sandra your still the best at this glass painting. I'll look for your finished piece.. Your paintings always glow and I know that's what we look for whether it's oil or watercolour. I think it's amazing how you do all those layers - out of curiosity, what would happen if you just started painting the final colours straight onto the canvas without doing these layers first? I use almost all transparent colours, which means the layers beneath glow through. So, the light shines through the layers to the ones below and then the light bounces back through each layer creating an effect that is far more interesting than it would be if the colour were just mixed in the pallet. It gives it a depth it wouldn't otherwise have. If I put the mixed colour directly on to the white canvas, not only would it be flat, but it wouldn't have the warm glow either. Also, the initial monochrome layer is a fabulous way of being able to manipulate and establish the composition before plunging in with the colour. Oh and no, I can't hear any music! C'est toujours un plaisir de suivre la progression de tes merveilleuses peintures! Your process is so interesting, Sandra. I enjoy seeing the painting come alive and begin to glow from within. Thank you very much Rebecca! It's always lovely see see a new face pop up! Your work is always beautiful, Sandra! 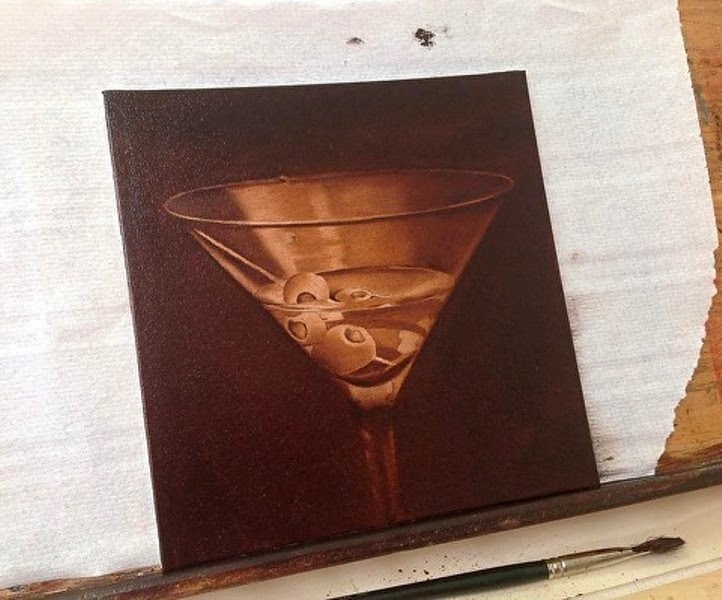 you have mastered painting glass!!! I look forward to your next post!! 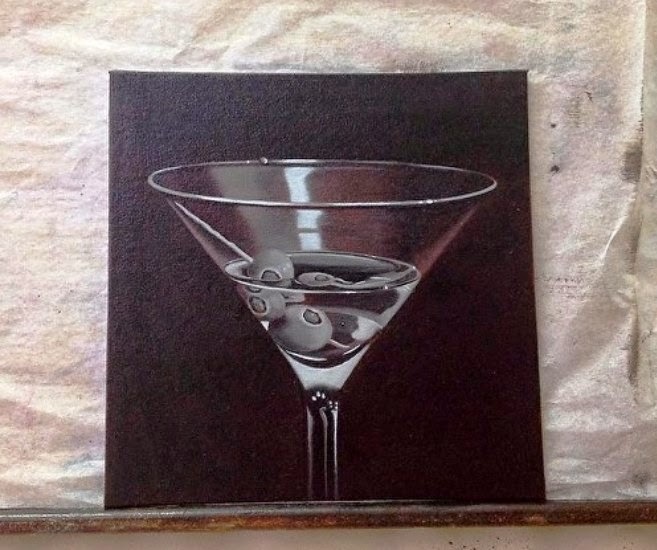 I LOVE your martini paintings Sandra! It's really the composition of the olives that get me ; ) Such an interesting element. Look forward to more progress shots! p.s. I really enjoyed your newsletter!